T4 hot side mods- anywhere local? Maybe a shot in the dark here but hey why not. Motor is a 2.8L 24v inline 6. Turbo is a T04R - T67 compressor, divided T4 hotside. I have a 1.00 A/R turbine housing and a P trim wheel. Power is OK but it's pretty laggy. I was thinking about going down to an 0.70 housing but I'm worried it will choke the motor (would like 500whp on pump gas). I've heard of Supra guys modifying a 0.70 housing to accept an O trim wheel- apparently this flows kinda like an 0.84 with a p-trim, but spools better. Problem is I need a modified housing (Garrett doesn't sell an O-trim version of an 0.70), and I would need to swap turbine wheels, so I'd need to get things balanced. Any shops do anything that elaborate here? I'd rather not have to ship my turbo to the states and back. Also, any thoughts on how a 0.70 A/R divided T4 housing with a P trim would be at 500whp? Kinetic used to do custom turbo/rebuilds. 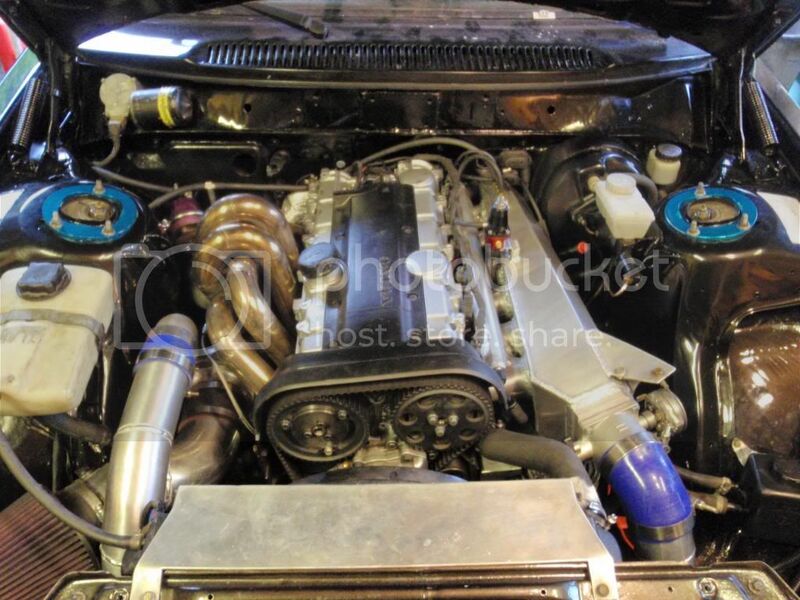 The T04R T67 journal bearing P trim turbo should easily make 500whp with a 70ar T4 housing. If you're worried about spool I would do one of 2 things, get a smaller turbine housing, or look at a new turbo. If you're looking for a new turbo check out the precision turbo lineup. I was there 3 weeks ago visiting their facilities, they have amazing new billet wheels, and their newest ball bearing system is air cooled only, it uses ceramic ball bearings as opposed to the steel ball bearings found in the garrett dual ball bearing. Anyway, if you need a housing or have any questions feel free to email the guy that godwin recommended, we import turbos/injectors/pumps etc. regularly, but generally dont' cater to the locals, 98% of our bus is to the states. The turbo itself is just kinda old school, if I really want to maximize spool vs. power potential I should look into the more modern stuff. But for now, since I really only want 500whp in this "stage" of the project, I'll just try the 70 A/R. I suspect that should fix the lag which really is almost tolerable anyways, just kinda inconvenient. Worst case scenario I kight need methanol injection added to do it on pump gas. Next stop after this will be something with GT wheels/housings and CBB, or maybe something from Borg Warner (not that it'll fit in my engine bay, the housings are freakin huge!). And yeah I checked out the profile. Last edited by Captain Bondo; 10-15-2009 at 02:16 PM. From my experience modifying turbine housings to fit larger wheels don't really work very well. One car we did this too gained around 20whp but spooled 1200rpm later. This could depend on the type of wheel your using. You'd probably be better off running the 0.84. I'm going to be running a .71 S-trim on my T72. I'll let you know over the winter how it works out. Interesting. I just noticed in my post I made a typo - I said "o trim" but of course I meant the next size bigger than a P trim - which I think might actually be an S trim. You got what I meant obviously anyways. The T72 seems like a pretty nice wheel for a 2.8-3.5L - I'm definitely interested to hear how that goes. Is that 0.71 housing twin scroll? I am a bit torn between the 0.70 and the 0.84 - the nice thing is the housings are really cheap so it;s not the end of the world to test both if need be i guess. I'm going to make a sheetmetal intake with a 75mm throttle body this winter - my existing setup is using the Q45 83mm one and the linkage is such that the pedal travel is a bit shorter than stock. I'm hoping that might make modulating the power a bit easier as well. I just want to make it a little bit more driveable. Yeah mine is a turbonetics twin scroll. Ideally I want to run a T72 with billet wheel and a .81 twin scroll hotside, but I just want to get my car up and running with the turbo I have first. Just an update - I ended up getting an 0.84 divided housing and a Bosch 044 through CTS. It's definitely got less volume than the 1.00A/R so hopefully it'll be good. If I can have full boost by 4500rpm I think I'll be pretty happy. 4000rpm would be stellar but I don't think it'll happen. If this doesn't work I'll probably go down to a 62mm turbo instead, unfortunately. Borg Warner S362, some Precision 626x variant, or Holset HX40 Pro will be the leading cantidates I think. It should run again this sunday! Got it all back together with the rebuilt motor. I am still doing break-in but initial results are... it seems about the same. It needs a bit of a re-tune due to the new intake manifold and I suppose the rings still need a few miles to seat which might help. I also might need to re-do the cam timing. Well part of backyard R&D.. hopefully you get some useful data out of it and some other uses for the turbo. I spoke too soon I think. lol. The old datalogs I was using from last year were 3rd gear pulls. My initial tests I was comparing them to were just short runs in 2nd. The fact thast it spools slightly better in 2nd than it did before in 3rd is dedfinitely an improvement. Comparing 3rd gear vs 3rd gear I picked up about 600rpm without any real tuning changes so it might not be too bad. Still a few gremlins to sort out before I can get back to the dyno though. Hopefully around the end of this month. Subscribed. I wanna see how it worked out for you. I've done business with CTS before and they're good guys. Ok this is a bit crude - but I did an overlay of a datalog in 2nd gear form last year vs. 2nd gear this yeah. The log form last year is running higher boost and I revved higher, but the comparison up to ~5000rpm is pretty interesting. 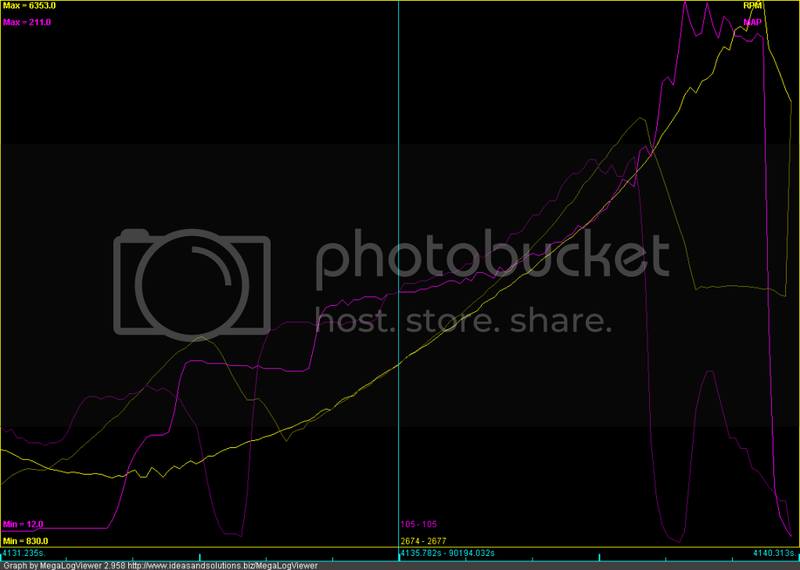 Note how much faster the rpms come up in the dark yellow compared to the bright yellow (dark is 0.84, bright is 1.00). Also I actually went wide open throttle later in the dark log so last year's log has a slight head start. You can see the spool is definitely better too. I think it will get even better with more wastegate preload. Tune wise they are pretty equal. This year's is a bit leaner on spoolup which helps, but I have pulled some timing too to be safer with the leaner AFR. I am interested to see how much sooner the boost is "all in" at 12 and 18psi. That data will be even more meaningful. Ok so it's good, bit I don't think it's quite what I want. I would never have expected it to flow that much. I would have expected it to surge for a while and then fall on its face. Being I only want 500whp, maybe I should downsize again? I have a similar comparison the the chart above to post form my own car, but with a couple differences. Timing and AFR were pretty conservative, myself and Shawn at Racing Greed were both listening for ping and never heard any. Plugs look good. Coolant temps were in the 180's. Tore the motor apart, piston, rings, and bore looked perfect. So good news is I didn't break anything, bad news is I ave no idea why it just randomly lost compression. A leak down test did verify that the loss of compression was out the crank case (so not a valve/head issue). Anyways I honed it and re-ringed it and compresison is back up, so I have no idea. I was pretty rich on a few pulls, so I am thinking maybe I washed the bore down. Seems odd, anyways. I was out of injector again so I have some 1000cc coming in. I really want to get to the track as well once I break in these new rings. So I bought an 0.58 housing to play with. Also ditched megasquirt for a VEMS. Should have the vems reasonably tuned and the new housing by next week, I will do some comparisons. Last update: The 0.58 did not spool any better than the 0.70. My suggestion for anyone running a P-trim wheel is to run the 0.84. It is the best compromise between spool and flow. I sold it and bought a Borg Warner 83-75, but I haven't driven it yet. The 83-75 definitely has less max hp potential but the response appears to be just insane. I'm not looking for more than 550whp or so, so it should do the job nicely. hey man... I dont think you can compare your dyno to supra's dyno? 2) Hate to break it to you, but on pump gas my motor makes similar numbers to similarly modded 2J's. 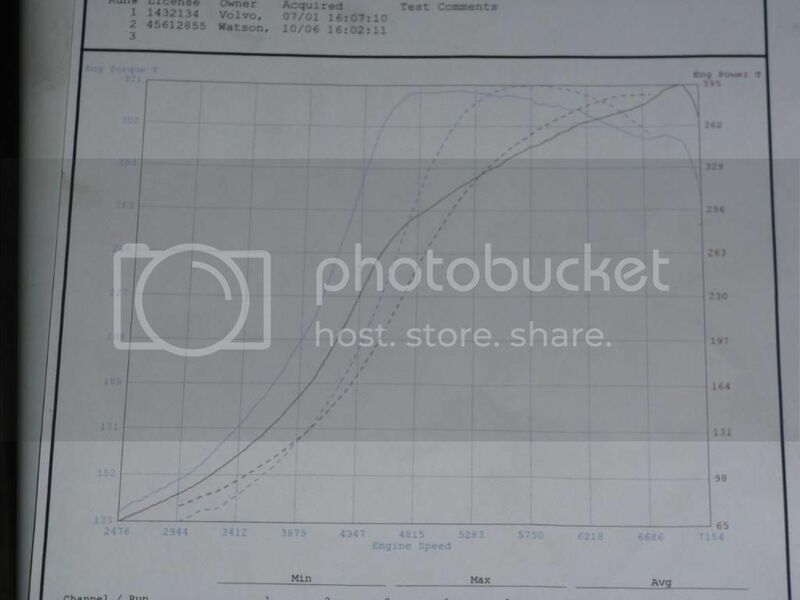 My motor is aluminum block, open deck, so granted, at some power level it won't stand up to the same max power/abuse a stock iron 2J block will without sleeves, but aside from that, in the sub 650whp realm, the comparison is legit. boost vs. boost it will keep up. If you're concerned about spool I would manage one of 2 things, get a lesser turbine lodgings, or gaze at a new turbo. If you're looking for a new turbo ascertain out the precision turbo lineup. The car has a GT35R sized turbo on it now instead of the T67. Response should be much improved. Unfortunately I haven't had much chance to shake it down yet.